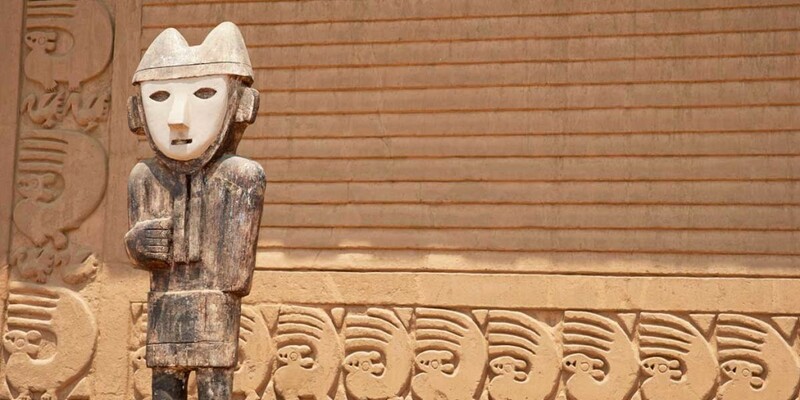 Built by the pre-Inca Chimú culture in the 13th century, Chan Chan is one of the last remaining constructions and connections to this highly advanced ancient culture. Although El Nino floods and heavy rainfall have eroded much of the once 20 square kilometer (9 sq. mi.) 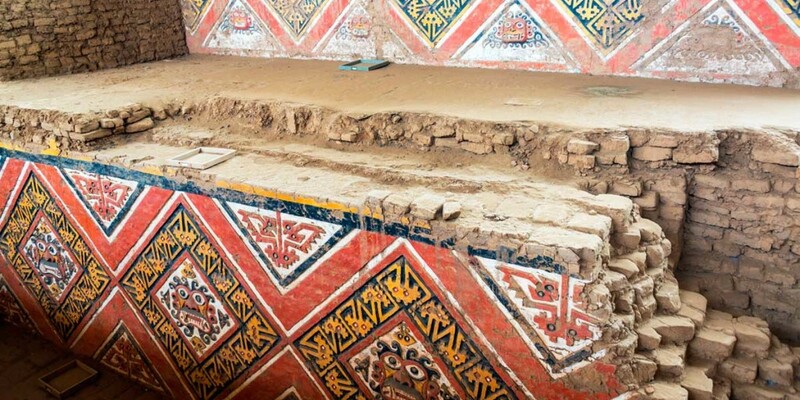 adobe city, enough is still intact to reveal insights into the culture and customs of the Chimú, including their strict hierarchal social and political systems and knack for highly organized city planning and engineering. 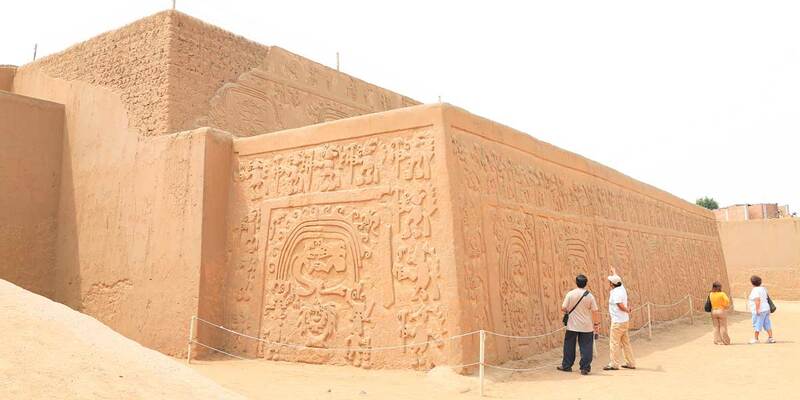 Once the largest adobe city on earth, Chan Chan is located five kilometers west of the northern coastal city of Trujillo at the mouth of the arid Moche Valley. The city served as the capital of the Chimú kingdom and housed an estimated 60,000 people during its heyday 600 years ago. As the seat of the empire, Chan Chan also contained a vast wealth of gold, silver, and ceramics, some of which can be found at the nearby site museum, the Museo de Sitio Chan Chan. Situated in Peru’s coastal desert region where average annual rainfall was traditionally less than a tenth of an inch, the population of Chan Chan relied on a sophisticated network of irrigation canals and wells for water. Their advanced irrigation methods were far ahead of their times, making them one of the first true engineering societies of the New World. The city was divided into ten walled citadels or royal compounds, each containing its own plazas, storerooms, and royal burial chambers. Today, the only restored and accessible section of Chan Chan is the Tschudi Complex. 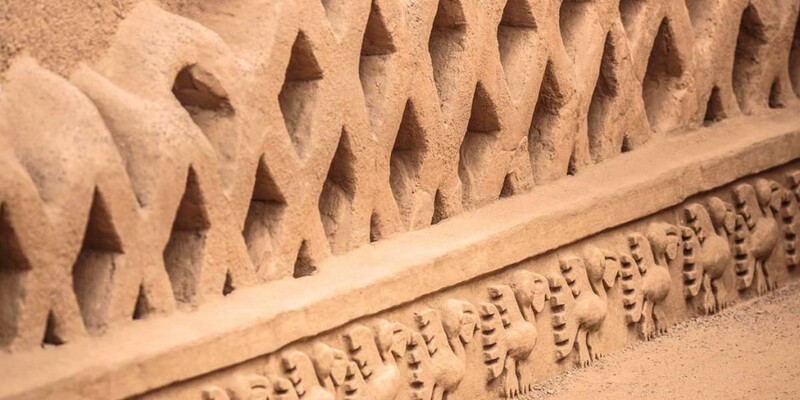 There, you can explore the restored ceremonial courtyards with their recreated geometric walls and designs, view elaborate friezes stretching hundreds of feet long, and enter the Mausoleum of a Chimú king. It is possible that more sections will open in the future but restoration is slow and preservation of the site is still widely up for debate. Climatic changes have led to increasingly more floods and heavier rainfall, threatening the very existence of this ancient adobe city. Efforts have been made to prevent further damage – coverings have been put in place and draining systems have been cleaned – but the debate on the best way to preserve Chan Chan is ongoing. Some archaeologists have even suggested building a waterproof roof over the entire city complex. Want to see this fragile and ancient walled city before it transforms from adobe to mud? Contact us today to include Chan Chan on your personalized Peru vacation itinerary.